Ambitious plans for a £100m Titanic tourist project in Belfast's docklands area have been unveiled. The project includes a full-scale model of the liner, exhibition galleries and a hotel and conference centre. It is hoped the attraction will be open by 2012, the 100th anniversary of the ship's launch. The proposal, which has been unveiled by Belfast City Council and the Northern Ireland Tourist Board, is expected to attract tens of thousands. The Titanic Signature Project envisages a centrepiece building, three times the size of Belfast City Hall, based on the slipway where Titanic and her sister ships were built. The adjacent Harland and Wolff drawing offices, the Hamilton and Alexander Dry Docks also are included. The Thompson Dry Dock would be brought back to life with the creation of a Ghost Ship - a unique light-sculpture of the ship that would be visible across the Belfast harbour skyline. A large-scale industrial sculpture park would sit alongside a hotel, conference and convention centre. The proposal and an economic feasibility study, were presented to Belfast City Council's Tourism sub-committee on Wednesday and will come before the full council on 1 September. Sub-committee chairman Councillor Diane Dodds said that in the past year the council and Tourist Board had taken on the challenge of bringing a Titanic attraction to life. "The council's goal of marking Titanic's birthplace in the ship's home city is now one step closer," she said. "Finally and rightfully the city that gave birth to the ship has begun to acknowledge its part in the tale. "This concept would celebrate the achievement that was Titanic, while also commemorating the tragedy and educating the world about our city's role in the Titanic story." Alan Clarke, chief executive of the Northern Ireland Tourist Board, said Belfast was closer to establishing a world class attraction. "Over the past nine months, a widespread consultation process has garnered support from all quarters and has shown that an attraction based on the theme of Titanic holds great economic, cultural and regeneration opportunities for all of Northern Ireland," he said. "The concept captures the imagination of people throughout Northern Ireland and interest within the international marketplace." Funding for the project will come from both the private and public sectors and the government is anticipated to get on board later this year. It is estimated that if the project becomes reality, then it should attract at least 400,000 visitors annually. 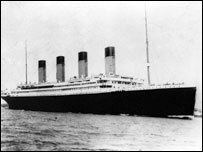 The Titanic sank in the Atlantic Ocean on 15 April, 1912, after setting sail from Southampton on its maiden voyage. More than 1,500 people lost their lives.